A diagram showing where the partial solar eclipse will be visible on September 11, 2007. The second partial solar eclipse of2007 will take place Tuesday, Sept. 11. On March 19, much of central andwestern Asia as well as a part of Alaska saw the new moon partiallyeclipse the sun. Now, just under a half a year later, the moon will againappear to cross in front of the sun. The dark shadow cone of the moon (knownas the umbra), from where the grand spectacle of a total eclipse is visible,will completely miss the Earth, passing 499 miles (802 km.) below the SouthPole and out into space. Meanwhile, the moon's outer shadow(known as the penumbra), from where the moon will appear to partially eclipsethe sun, will slice into a part of Antarctica and the the lower two-thirds ofthe South American continent giving a potential viewing audience of over aquarter of a billion people the opportunity to watch the moon partially coverthe sun. The spectacle of a partial solareclipse is usually shunned by professional astronomers because it lacks thedrama and beauty of a total solar eclipse. Yet, a partial eclipse of the sunaffords many people the opportunity of viewing firsthand the dark disk of themoon crossing in front of the sun. Philip Harrington, in his book, "Eclipse! 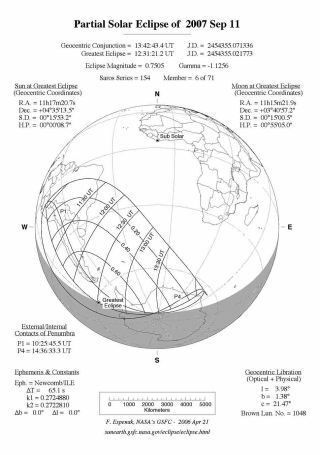 "(John Wiley & Sons, Inc., 1997), writes: "A partial eclipse, whetheror not it leads to totality or annularity, offers a wonderful opportunity toexperience the magic of astronomy." The penumbra first touches downover Bolivia at 10:26 UT (Universal Time), not too far to the east of thecapital city of La Paz. The shadow quickly spreads eastward and by 11:30 UTvirtually all regions in South America that are within the visibility zone ofthis eclipse are under the shadow. Just over an hour later, at 12:31UT, greatest eclipse occurs over open ocean waters, to the west of the Drake Passage (which has earned a place in history as having some of the roughest seaweather on the planet). A shipboard observer would see the sun sitting on thesea horizon, a bit to the north of due east and resembling a slice ofcantaloupe; a fat orange-yellow crescent with the cusps pointing straight up. Thepartial eclipse peaks at this spot on the Earth with 74.9-percent of the sun'sdiameter covered by the moon's dark silhouette. The shadow then turns south wherethe closing stages of the eclipse may be seen from a few remote researchstations in Antarctica, where the sun takes 9 or 10 hours just to skim abovethe local horizon, moving east-northeast to west-northwest, while peaking verylow in the north. The penumbra finally leaves the Earth at 14:37 UT. One word of caution to those whowill be in the eclipse viewing zone– be very, very careful about the precautions for eclipse viewing. Never lookat even a tiny bit of the sun's disc unless you are using a proper filtrationdevice like No. 14 welder's glass or aluminized Mylar plastic to protect youreyes! The safest method is not to look at the sun at all, but rather projectits image through a pinhole and onto a piece of white paper or cardboard. Moresafe viewing tips can be found here. Times for locations in SouthAmerica and Antarctica can be accessed from the NASA EclipseHome Page. Next year there will be two solareclipses. Both are central, the first being an annular on Feb. 7 that few arelikely to see as it passes across Antarctica. On Aug. 1, the first total solareclipse in nearly two and a half years will start over the Northwest Passage ofCanada, gives a glancing blow to northern Greenland, then heads southeastthrough Siberia and western Mongolia before ending near the famed Silk Route ofChina. Joe Rao serves as an instructorand guest lecturer at New York's Hayden Planetarium. He writes about astronomyfor The New York Times and other publications, and he is also an on-camerameteorologist for News 12 Westchester, New York.